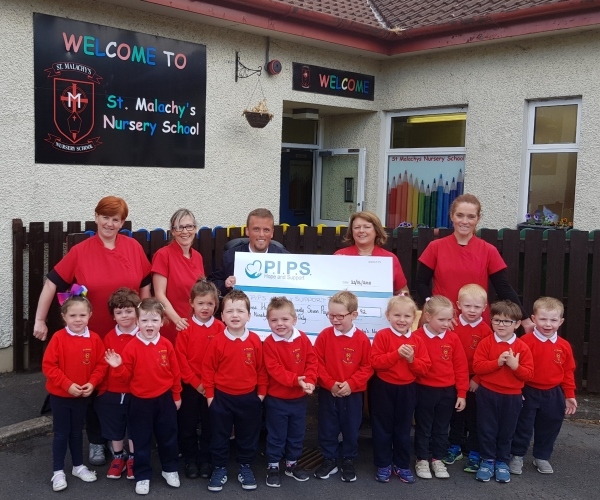 On Thursday 21st June 2018, we were invited along to St. Malachy's Nursery School to meet with the young children and staff who along with their parents took part in a Sponsored Walk on 13th June 2018 at Slieve Gullion Forest Park to support PIPS Hope and Support. A fantastic total of £377.92. Ms Christine Campbell (Principal), staff members and some of the children involved in the fundraiser are pictured presenting our Community Fundraiser Padraig with a cheque.